Manager Mark McGhee was left frustrated by a moment of misfortune and a piece of slack play as Motherwell lost a late goal to Partick Thistle. 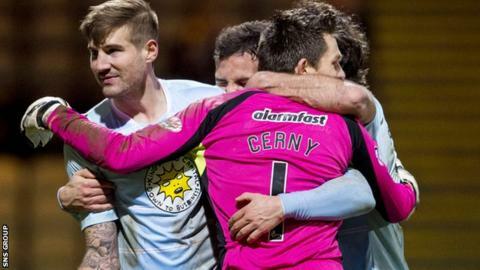 A Steven Lawless shot was deflected past Connor Ripley in the 90th minute of a 1-0 home win at Firhill. "We shot ourselves in the foot because the goal was avoidable, one of our players switched off," McGhee said. "The boy got in behind, it gets a big deflection and we've lost a game we didn't need to lose." The match looked destined to end in a goalless draw, with few chances created throughout a hard-fought encounter. The late strike from Lawless lifts Thistle above Motherwell in a congested Premiership table, but McGhee already considered his side to be in a battle to avoid dropping into the relegation zone. It was also the second consecutive game in which a late goal has denied McGhee's side valuable points, with Dundee equalising in a 2-2 draw at the weekend in the closing stages. "We've not thought anything else other than we're in a dogfight," McGhee said. "Even if we'd won tonight I would be saying the same thing. We've shown that we matched Thistle all the way, they've got the break and taken advantage. "There will be games when we're the ones who do that. We've just got to make sure that there's more of them than what happened tonight. "There's not a trend that's costing us to lose a [late] goal. On Saturday it was a penalty kick that was never a penalty kick in a million years. Tonight it was a goal we could have avoided by somebody being more alert." Alan Archibald admitted that the weather and the state of areas of the pitch - patches were bare and heavily sanded due to the recent heavy rain - affected the game. At this stage of the season, though, it is points rather than performances that matter more to the Partick Thistle manager. "A bit of luck, we get a deflection, that probably summed up the game," Archibald said. "It wasn't much of a match. We knew that was going to be the case because of the conditions, and we probably played to the conditions too much. "When it opened up we could have passed it better. We're just delighted to get the three points, which is all that matters on a night like this. "Both teams cancelled each other out for long periods, there wasn't much goalmouth action. Motherwell slightly shaded it in the first half, but the second half we were a little bit better. "The ref played a bit too much time, as they do. We'll take a bit of luck, and the clean sheet because Motherwell are hard to play against with a good front two up top."